The year 2018 started well. 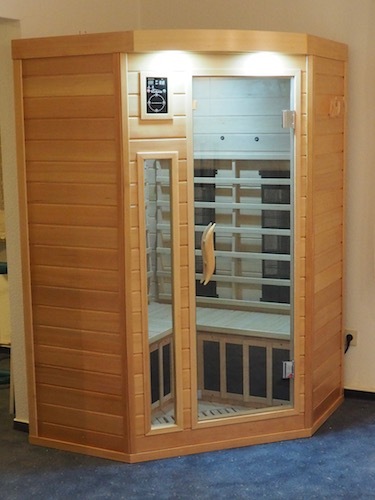 The infrared sauna which we had ordered some months ago and which was delayed more than once, eventually arrived. Assembling the kit took about half a day. After that we were armed against all colds, muscle and joint problems, you name it! But, sauna or not, the weather outside showed us once more that we are living in Western Europe. 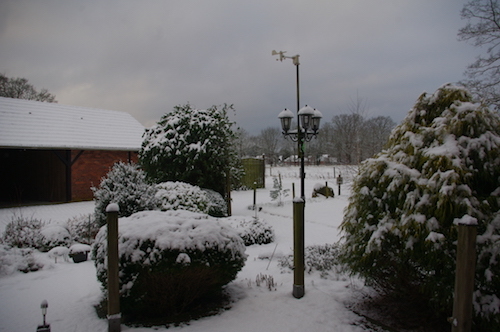 Hence we decided to spend some time in a warmer climate. 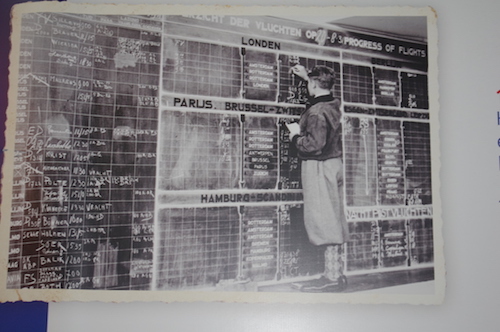 Our Amsterdam acquaintance Steven Oppenheim, specialised in Israel travels, sold us an attractive package of flight tickets, hotels and car rental. Apart from being the tourist, we're also going to see some relatives. 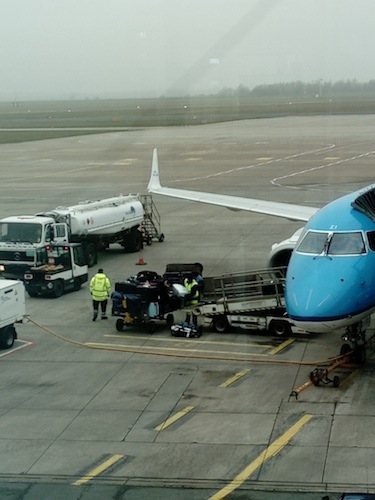 Mid-January we left cold Bremen to our stop-over in Amsterdam. 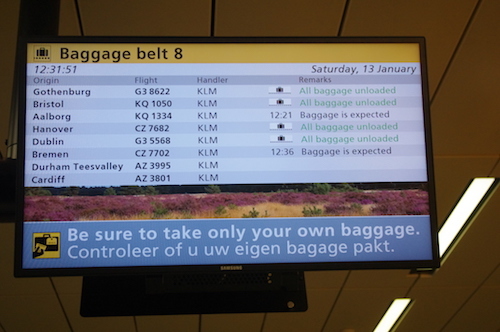 In Amsterdam we had to wait about an hour for our luggage. No clue what was going on, but it really was ridiculously long! Exactly when I (Ernst) turned 70, Judith expected her baby. [Yetta arrived the day after my birthday.] 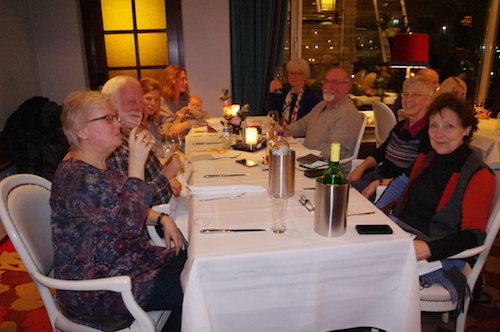 So the birthday party for the family - and some close friends - was two months overdue. 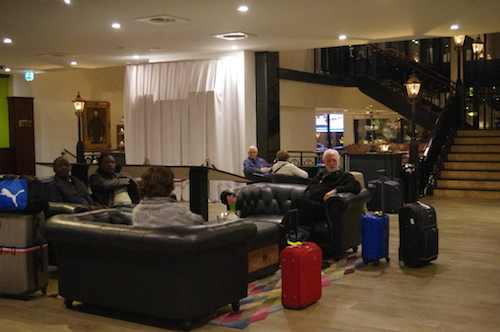 We had made a reservation in an airport hotel and invited our guests there. 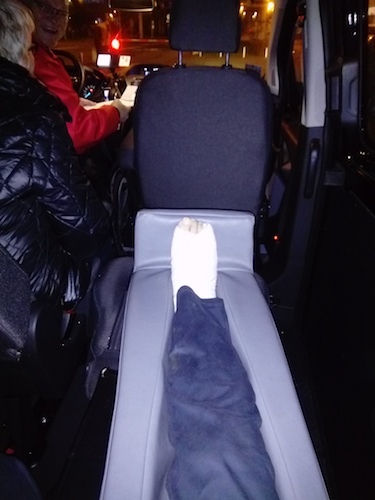 When I got off the shuttle bus from the airport to the hotel, I landed wrong and my ankle was sprained. At least, that's what I thought. That happens to me a couple of times each year. Walking was painful, but sitting at the dinner table I had a good time. 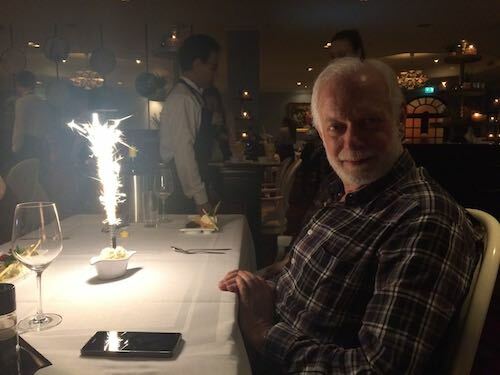 When the hotel staff learned it was a birthday dinner, they surprised me with a festive ice cream as dessert. 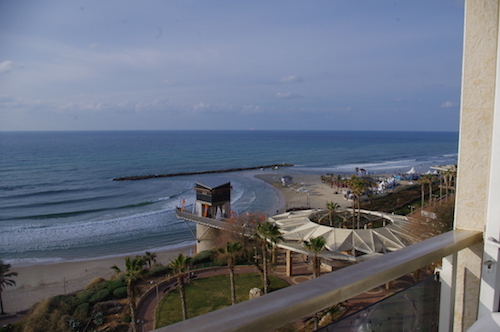 Our flight to TLV departed on time. But the next morning I could no longer walk at all. Driving was no option either. 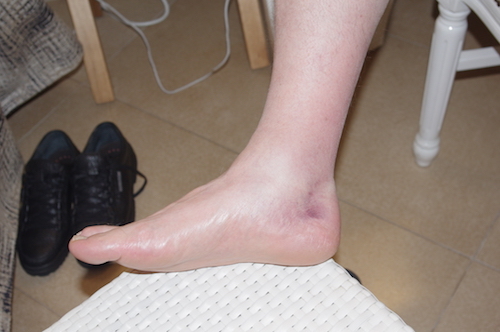 The leg and foot were swollen and the bruise was not where it usually is when I sprain my ankle, but at the heel. This was something different! 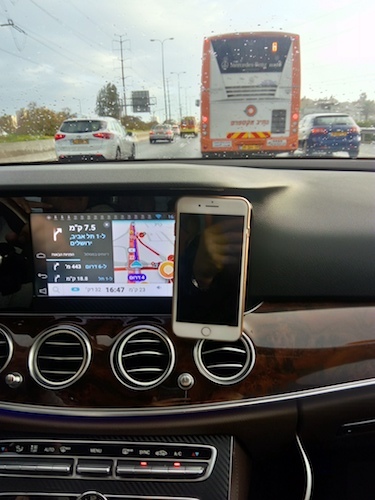 There would be no more driving for some time. Sylvia succeeded in getting the local Hertz people to collect the car. 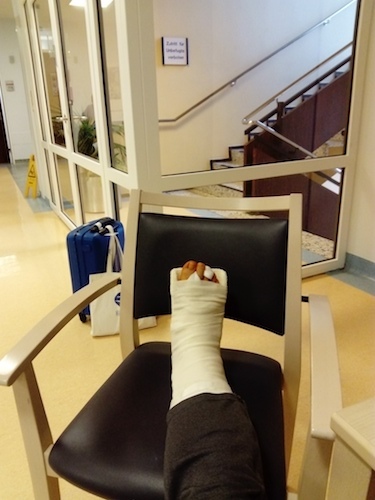 On the way back she stumbled on the uneven sidewalk and sprained her ankle badly! Was she jealous? We took a taxi to the nearest hospital, the Laniado, where we reported at the emergency department. Within five minutes they weighed me, took a blood sample, determined my heart beat, blood pressure and oxygen saturation. Then we were transferred to the orthopedic department. 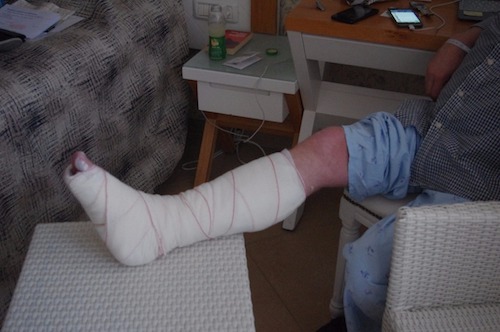 The (Russian) orthopedic surgeon wanted the radiologist to examine my leg with ultrasound. He warned me I'd have to wait some time, because I didn't have an appointment. Emergency department, remember.... So we waited. And waited. And waited. After an hour Sylvia asked the surgeon if something had gone wrong, but she was sent back and told to wait a little longer. When she went again to check after another hour, we found out what had gone wrong! At the front desk they had copied my data from my passport. Ernst Willem Sittig was entered in the computer as "sitig ernst wili" (Hebrew has no capitals.) And when a nurse had called for "Vili! ", Sylvia and I had no clue! The ultrasound showed a completely ruptured Achilles tendon. So, no sprained ankle! 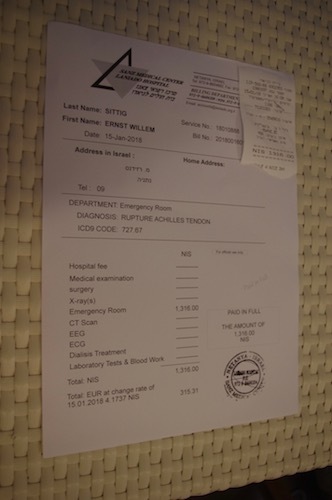 We were charged the standard fee for tourists who need the emergency room, ₪ 1316. 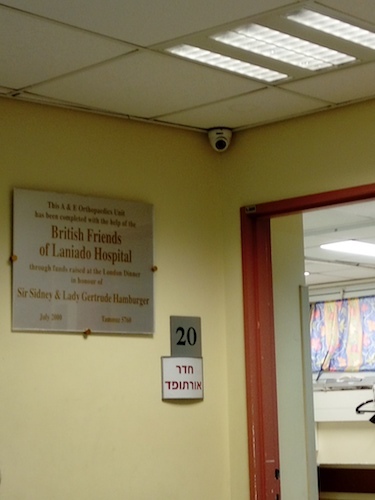 In the Laniado hospital they were eager to operate on me the next morning! 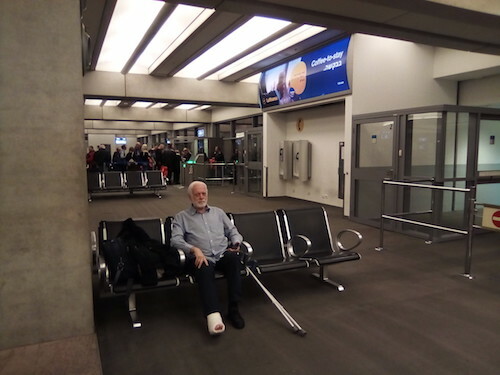 But because things hadn't be cleared with our travel insurance - and because of the rather dubious fame of the hospital - we decided to fly back to Europe as quickly as possible and have surgery there. 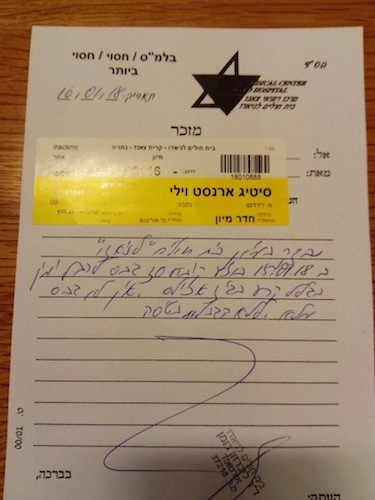 The next two days were filled with telephone calls with the alarm centre of the insurance company, taxi rides to buy crutches and taxi rides to obtain a "fit-to-fly statement" without which one apparently cannot fly. There is not much one can do as a tourist with a plaster cast. 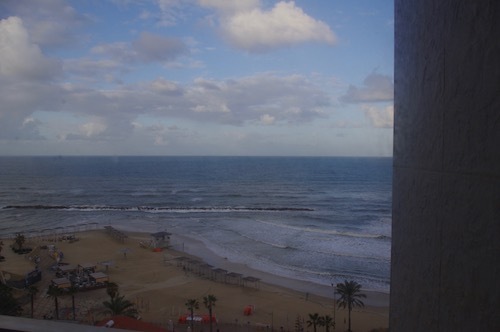 Well, one still can enjoy the weather and the view of the Mediterranean. The notorious "fit-to-fly statement". It took us about a day to get it. Waste of time.... no one ever even asked for it! On our way to the airport we had a chance to see Sylvia's cousin Tali and her husband Danny. Exactly at the agreed time a taxi arrived to drive us to the airport. On the plane there were three seats reserved for me, so I could sit across. 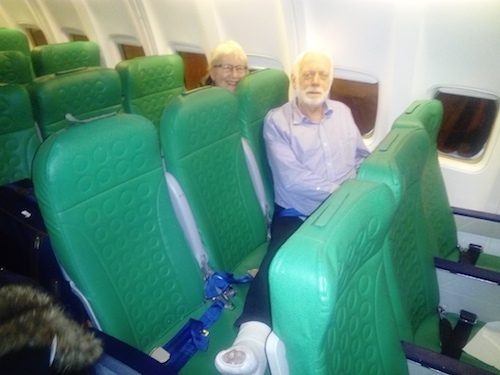 Only problem was that the window side armrest could not be folded up and that there was no cushion or blanket anywhere in the whole (charter) aircraft. 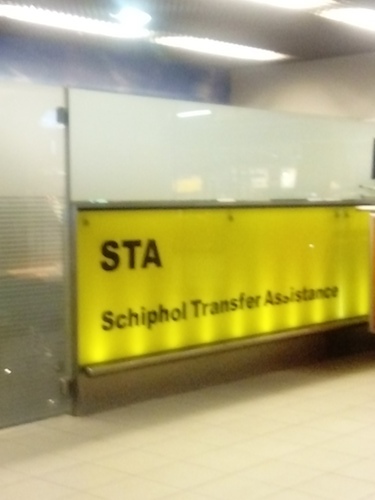 On Amsterdam Airport, where we arrived around midnight, again someone with a wheelchair was waiting for me. I was rolled through the nightly airport with great speed. Sylvia was struggling to keep up with us. In a far corner there is a counter where "normal" travelers never come. Ten minutes later, I was seated in the reserved taxi van which drove us all the way to Großenkneten (3½ h). All praise for the organizational talent of the people of SOS International! At 4 AM we were home. 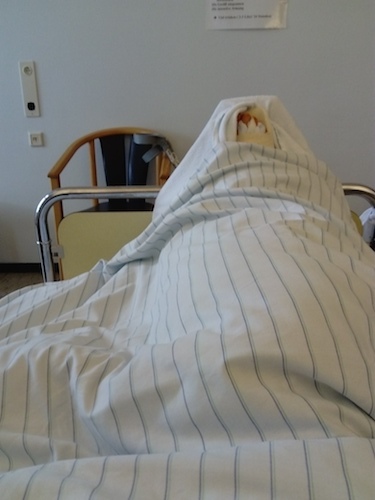 At 2 PM I was seen by the orthopedic surgeon in Cloppenburg (another taxi ride) and three days later the torn tendon was sewn together. 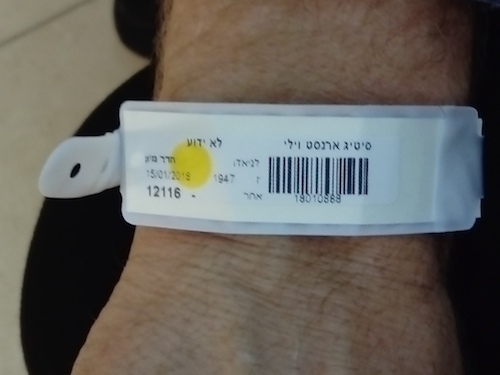 Laniado hospital would have been simpler with respect to transportation and to kosher meals, but communicating in German still is easier than in Hebrew and/or Russian. Here I am waiting for yet another taxi to take me home after after a week of hospitalisation. 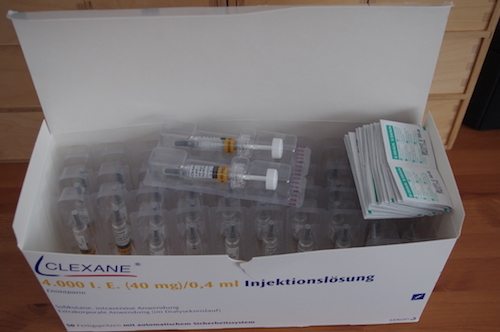 A large stock of Heparin to prevent thrombosis. I have to inject myself daily as long as I can not move my right leg. 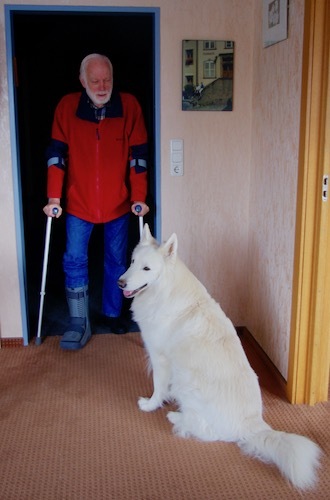 The cast was replaced by an elegant boot. Fortunately, Helena and Amy, our British dog sitters, could assist Sylvia by driving her to the shops. Elisabeth and Rolf helped by retrieving our car from the parking near Bremen airport. 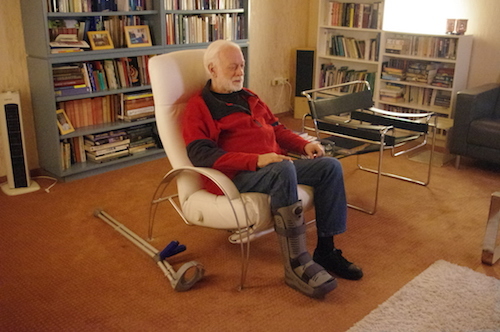 With the boot, it took some time to get used to operating accelerator and brake in a subtle way. Thank G'd our Outlander is fully automatic. No walks with Motek for some time. 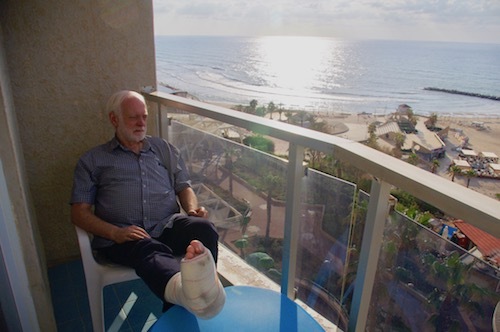 This was the story of an Israeli holiday, gone wrong. By only one small misstep. Sylvia turned out to be the perfect travel companion (which I knew) and nurse! In the Spring break daughter, son-in-law and the four grandchildren came to see the patient. 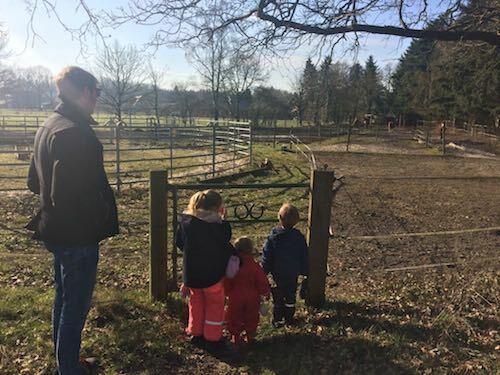 Horses are always fascinating for the "bigger little ones".